Well, the Maharashtra Public Service Commission released MPSC Tax Assistant Recruitment 2018-2019 Notification. Now, all those people who are looking for the MPSC Advertisement 2018-2019 can check this post. This Post contains all the correct information about the Recent MPSC Recruitment 2018-19. www.mpsc.gov.in 2018 Advertisement for the 862 Tax Assistant, Clerk-Typist (Group A) Vacancies is surely a good chance for all the people who are looking for the Government Jobs in Maharashtra State. Now, the officials of the Maharashtra PSC are looking for the people who can work efficiently. Therefore, for this purpose, they are going to see some Eligibilities in all the applicants. So, they clearly mentioned in the advertisement all of them. Hence, at the time of applying all the people should have them as the Qualifications. Otherwise, the officials are going to reject the application forms for the MPSC Tax Assistant Recruitment 2018-2019. Check next sections. MPSC Tax Assistant Recruitment 2018-2019 Notification is out on 22nd March 2018. Yet many of the unemployed people are unaware of this. Therefore, to help all such people and to create the necessary awareness, we are writing this post. Accordingly, all the people are going to get information such as the Name of the Organization, Name of the Vacant position, Number of Vacancies available, Educational Qualification, Starting date to apply, Closing date to submit the application form, Age Limit, Age Relaxation, Salary, Selection Process, Application Fee and other stuff. 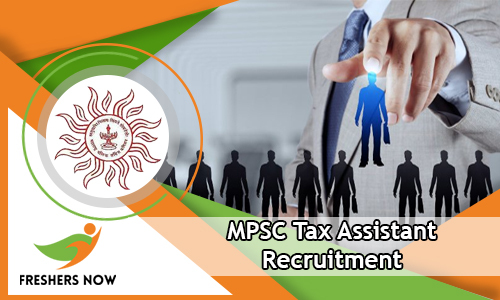 Along with this information, on this page, we are also providing data like the steps to apply for the MPSC Tax Assistant Recruitment 2018-2019 Notification. Therefore, please check them all. Now, the Contenders can start applying from 22nd March 2018. And the final date for submitting the application form is 11th April 2018. Check further for more. Go and check the above table. And it contains all the important information that you all need to know. And more other information apart from the above table are listed further in this post. Now, the important Qualification, that all the people need to have is correct education. As per the information that is given in the MPSC Tax Assistant Recruitment 2018-2019 Notification, all the people who are applying should have finished their Degree from any recognized institute or University in India as the Educational Qualification. Also, the officials of the Maharashtra PSC asked the people, able to write, Speak and Read Marathi as the additional Qualification. Therefore, please proceed to find out other information, only if you are having the above stated as the Educational Qualification. So, the officials of the Maharashtra Public Service Commission are very particular about the Qualifications. In cases like if the candidates are unable to reach the requirements, then the officials are going to reject all such application forms. Therefore, keep this in mind and proceed further. Along with the Educational Qualification, next important thing all the people should be aware of is correct age. Basing on the data that is given in the MPSC Tax Assistant Recruitment 2018-2019 Notification, all the people should also know that the officials are expecting the people to have the correct age. Now, the source in the Advertisement confirms that the people applying should have the minimum age of 19 years. Also, the maximum age of 38 years is acceptable. Also, there is some Age Relaxation available. And the Age relaxation will be as per the terms of the organization. So, check the advertisement itself. Now, the officials of the Maharashtra Public Service Commission are offering a wonderful salary for all the people who will get a job through the organization. According to the data that is given in the MPSC Tax Assistant Recruitment 2018-2019 Notification, Selected people are going to get Rs.5,200 to Rs.20,200/- Per Month along with the Grade Pay. The Salary is same for all the Positions, that the officials notified in the MPSC Tax Assistant Recruitment 2018-2019 Notification. So, the Grade Pay will be between Rs.1,900 to Rs.3,500/- Per Month. Surely, this is a good and handful amount. This is why many people show interest to join in the Government Sector rather in the Private Sector. Therefore, if you are also interested in applying, then please go ahead and check more other information that is mandatory. Well, to complete the application submission process for the MPSC Tax Assistant Recruitment 2018-2019 Notification, all the people should pay the application fee. And the officials of the Maharashtra PSC will fix the application fee. And they have mentioned that the application fee will be as per the category. Now, the people from the General and OBC Category have to pay Rs.374/-. And the applicants belonging to the ST/SC/Ex-s/PWD need to Pay Rs.274/-, as the application Fee. Please consider in checking the official portal of the Maharashtra Public Service Commission or the MPSC Tax Assistant Recruitment 2018-2019 Notification, that we have attached at the bottom of this post. Remember that only after paying the application fee before the final date will make your application valid. If not all such application form is rejected. Now, after submitting the application form, the officials of the Maharashtra PSC are going to conduct some Recruitment Rounds. And through this Rounds, they are aiming to choose the best applicants for the available vacancies. Now, as per the information in the MPSC Tax Assistant Recruitment 2018-2019 Notification, the applicants who are eligible, will be invited to participate in the Written Examination and Personal Interview. Now, a contender will go to the Interview round, only if he or she clears the Written Examination. So, all the people need to prepare and practice well. Degree. And the applicant should be able to read, Write and Speak Marathi. Now, please check the official site of Maharashtra Public Service Commission at mahampsc.mahaonline.gov.in. Then search for the MPSC Tax Assistant Recruitment 2018-2019 Notification for 862 Clerk-Typist (Group A) Vacancies. Check the complete information given in it. if you are eligible, download the application form. Satisfied with the information provided about MPSC Tax Assistant Recruitment 2018-2019 Notification for 862 Clerk-Typist (Group A) Vacancies? then are you looking for more such informative sources, then explore our site Freshersnow.com regularly.